Dubai, UAE, 20 April 2016: Ellington Properties – a Dubai-born design-led boutique property development company that develops bespoke and beautiful high-quality homes – today announced its project pipeline of 14 developments in Dubai. The new projects will add over 2,200 residential units including apartments, townhouses and villas. The company, jointly set up by industry veterans and joint managing directors Robert Booth and Joseph Thomas, already has over 3.6 million square feet in gross floor area under design and construction. The firm undertakes the full spectrum of development services from design to construction, advisory and rental unit development. At a media roundtable, Booth said: “Dubai has evolved as a new global city all within the space of 10 years during which over US$85 billion was invested in infrastructure projects. Simultaneously, the Emirate’s population grew from 1 million in 2000 to over 2.5 million in 2015. Booth, who has been involved with the development of several iconic projects such as Dubai Marina, Emirates Hills, Arabian Ranches and Downtown Dubai, said that Ellington was set up to develop residential projects for discerning customers who appreciate design – from first principles to last detail. Benchmarked against the world’s best, the firm has drawn the best international professionals to create a company that has design in its DNA. “The visionary foresight of the leadership will continue to drive the growth of Dubai, which will continue to flourish in every aspect,” explained Booth. 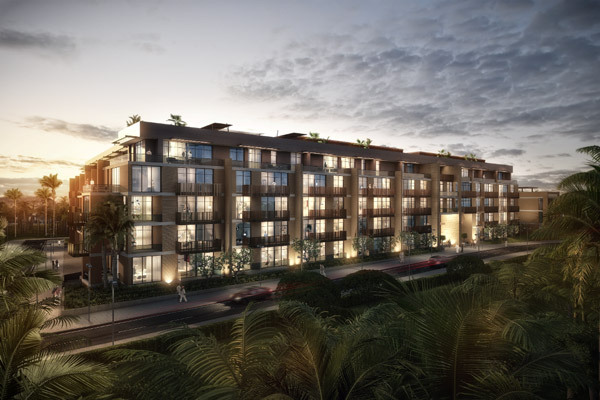 Ellington Properties unveiled its first project, Belgravia, in Jumeirah Village Circle which is a G+4 residential building with 181 modern one, two, and three bedroom units. The homes sit on a beautifully landscaped 100,000 square feet land, with amenities including a swimming pool, gym and indoor and outdoor kids play area. Construction will be completed in December 2016. “We have crafted each home with great attention to details, striking a tasteful balance between classic elegance and cutting-edge design and integration,” said Joseph Thomas. “These homes will set a benchmark in property development and the home warranty we offer will redefine the after-sales market. “We are a customer-focused organisation with an eye for detail. We launch our projects for sale only after we attain significant construction milestones. This ensures complete transparency in all our operations, adding to investor confidence,” added Thomas. Ellington has three other projects that have commenced construction activity – DT1, a 17-storey tower with 130 studio, one to four bedroom apartments in Downtown Dubai; The Ellington Collection, a set of high-end luxury villas on Palm Jumeirah, and Belgravia II, a G+4 residential building with 188 modern studio, one, two and three bedroom units in Jumeirah Village Circle. All projects have broken ground with Belgravia having topped out and ready to welcome its first residents in the fourth quarter of this year. The company has also won industry recognition with DT1 bagging the ‘Best Residential High Rise’ honour at the 2015 Arabian Property Awards. Ellington has also finalised its plan for affordable rental units development programme which will see over 10,000 units being developed by 2020.